CIO vs. CDO: What's the difference? CIO vs. CDO: Who Should Drive Digital Transformation? The role of Chief Digital Officer (CDO) is the latest addition to the C-suite collection, a response to the growing pressures of digital transformation. But not all companies are on board with the new role – at least, not yet. 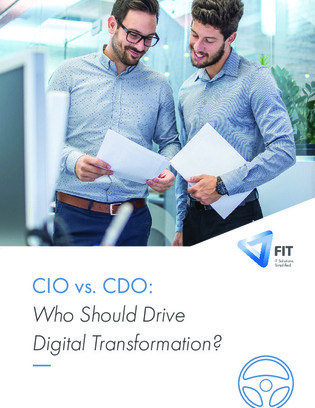 In this white paper, learn what sets the CDO role apart from CIOs and CTOs. Plus, discover why leading companies are following suit and the benefits that can emerge from having a dedicated digital transformation leader to spearhead the charge.